It's difficult to improve upon a coconut cake for birthday celebrations. 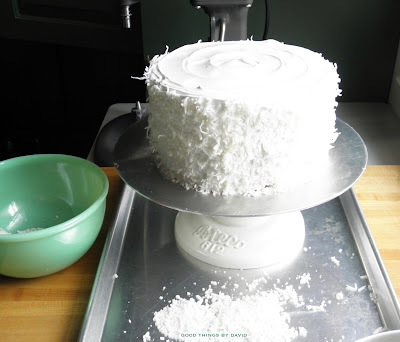 Over the years I've made many coconut cakes, some of which have had white cake layers, yellow cake layers and even angel food cake layers with or without coconut flakes in the batter. In terms of frostings, I have used boiled icings, seven minute frostings and buttercreams, all of which have been showered with sweetened, flaked coconut. Delicious! 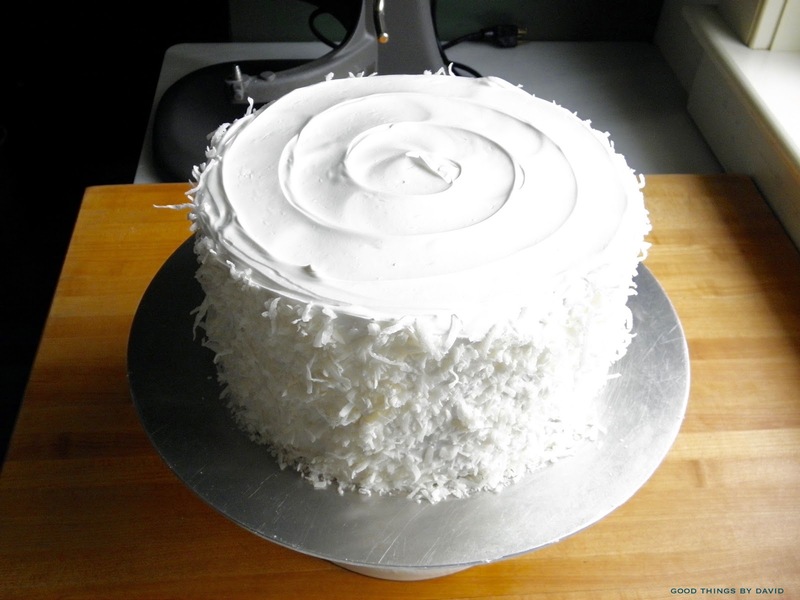 When I was recently asked to make a birthday cake with coconut as the main ingredient, I decided to keep it simple, so I went with the all-too-familiar 1-2-3-4 cake. This butter cake makes excellent cake layers, but it also makes great cupcakes and sheet cakes if you scale down or scale up the proportions. With a few ingredient changes and additions, I baked scrumptious cake layers without having to add flaked coconut to the batter. For the icing, I turned to my Swiss Meringue Buttercream recipe and left out the butter. 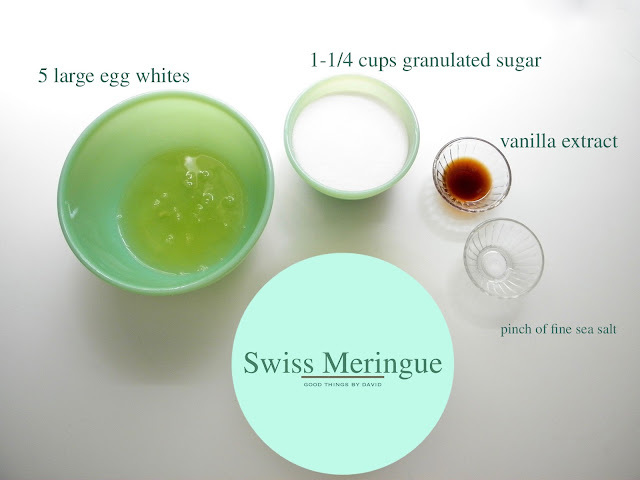 Swiss meringue by itself is very much like a marshmallowy seven minute frosting, but there is no need to boil a sugar syrup to the soft-thread stage or beat the meringue for 7 minutes. It's ready in under 5 minutes. 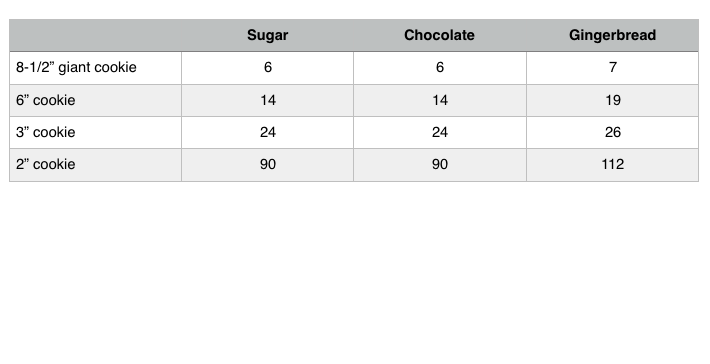 Note: I didn't measure out the flaked coconut that was used to garnish the sides of the cake, so use it at your discretion. The more the merrier! 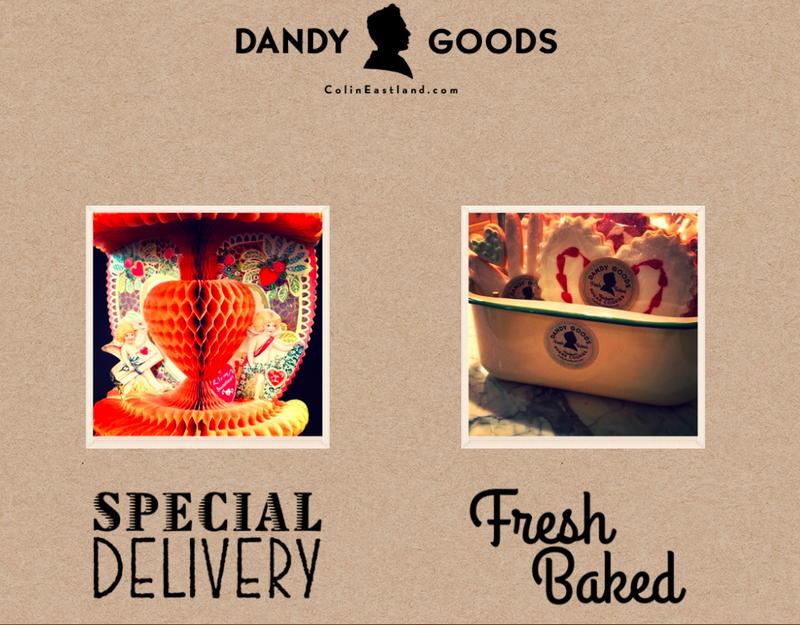 Equipment: two 8x2" round cake pans, parchment paper rounds, nonstick baking spray. Ahead of baking, spray both cake pans with nonstick baking spray (the type with flour added) and add parchment paper rounds to the bottoms of the cake pans. Set them aside. 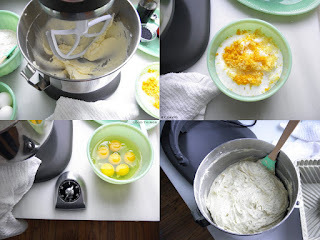 In the bowl of a stand mixer fitted with a paddle attachment (or using a handheld mixer), cream the unsalted butter on medium speed for 30 seconds, just until lightened. Gradually add the granulated sugar & fine sea salt in a steady stream and continue to beat on medium speed for about 4 minutes. The mixture should be thick, fluffy & pale. Stop and scrape down the bowl & paddle at least once during this process. Add the eggs one at a time on medium speed and beat until fully emulsified, about 30 seconds per egg. Stop and scrape down the bowl & paddle at least once. Beat in the vanilla extract & coconut extract. Add half of the coconut milk. Add another 1/3 of the dry ingredients and then add the last of the milk. Beat in the final 1/3 of the dry ingredients. 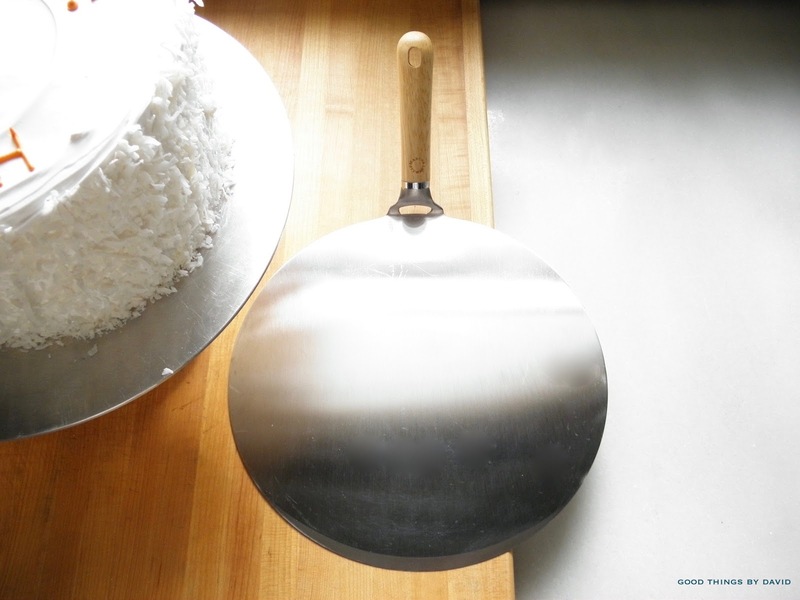 Remove the bowl and paddle from the mixer and give the cake batter a few turns with a large spatula just to make sure everything is incorporated. You don’t want any stray bits of butter on the bottom of the bowl or any flecks of flour. Evenly divide the batter among the prepared cake pans. Bake the cake layers for 45-50 minutes. A toothpick inserted in the middle of the layers should come out clean. The tops should feel springy. Let the cakes cool in the pans for 15 minutes. Gently remove them onto racks and cool completely before frosting. 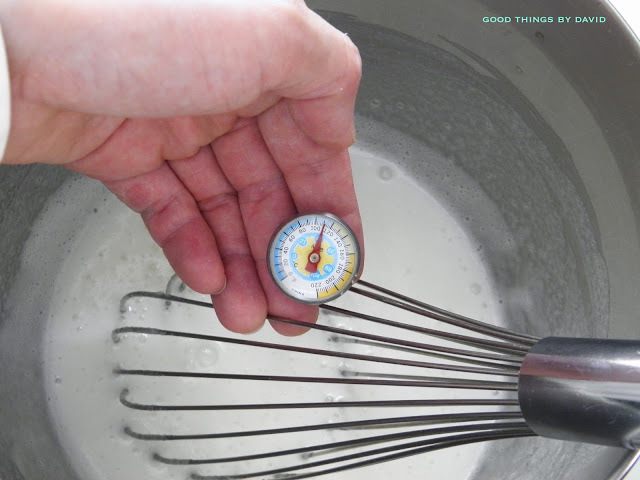 Equipment: stand mixer with whisk attachment, instant read thermometer, balloon whisk. In the bowl of a stand mixer, set over a pot of simmering water, whisk the sugar and egg whites. The bottom of the bowl should not be touching the simmering water in the pot. 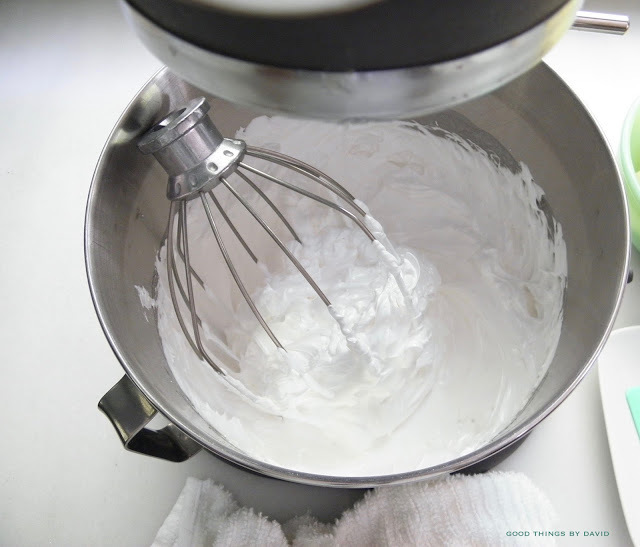 Whisk the sugar/egg white mixture until thickened and milky white. Using an instant read thermometer, check to see when the mixture reaches 120F. It's ready to transfer to the stand mixer when it comes to that temperature. Attach the whisk beater on the stand mixer and beat the mixture on high speed for approximately 4 minutes. Beat in the extracts and pinch of salt. The Swiss Meringue should be thick, white and billowy. Frost the cake layers without a moment to lose. It's important to use the instant read thermometer to make sure the sugar/egg white mixture is ready for beating with the mixer. A good Swiss Meringue should be thick and billowy when done. This is now ready to use for frosting cake layers. Work quickly before it begins to set. Do you see how it holds a stiff peak? It's perfect! 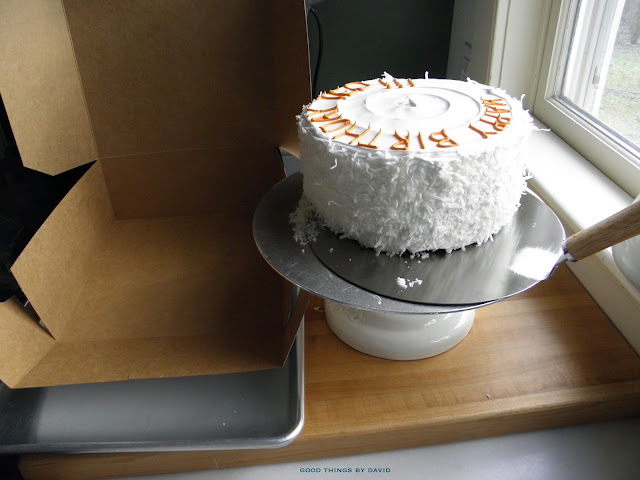 Lay one of the cake layers on your cake turntable (use a cardboard cake round underneath the cakes to support the layers). 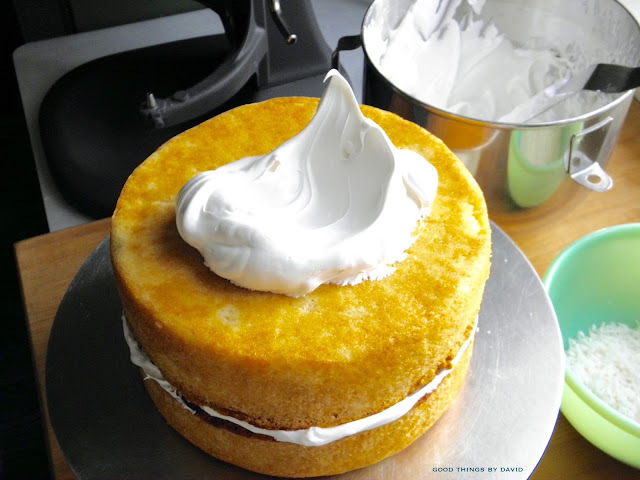 Add some of the meringue frosting with an offset spatula and smooth it out to the edges of the layer. Sprinkle it with sweetened flaked coconut. 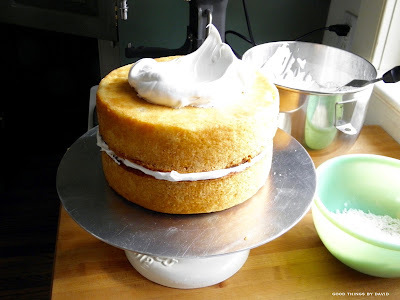 Gently layer the other cake (center it well) and add a large dollop of frosting on it. 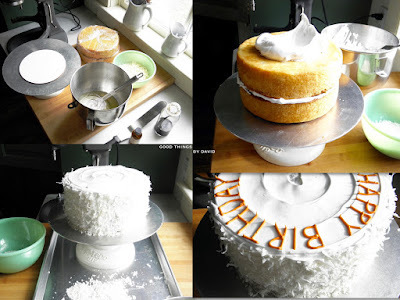 Smooth it out and bring it down the sides of the cake to cover completely. 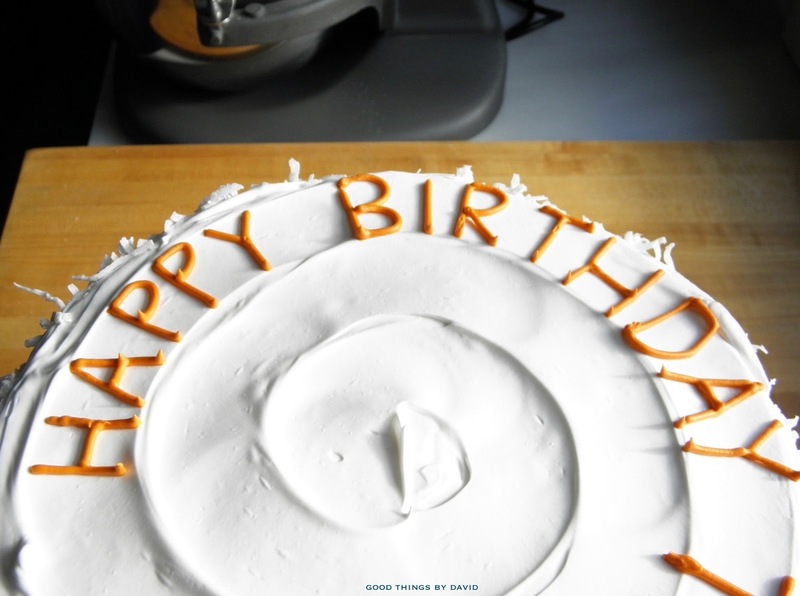 Continue doing this with more frosting, turning the cake table so that you have even sides. 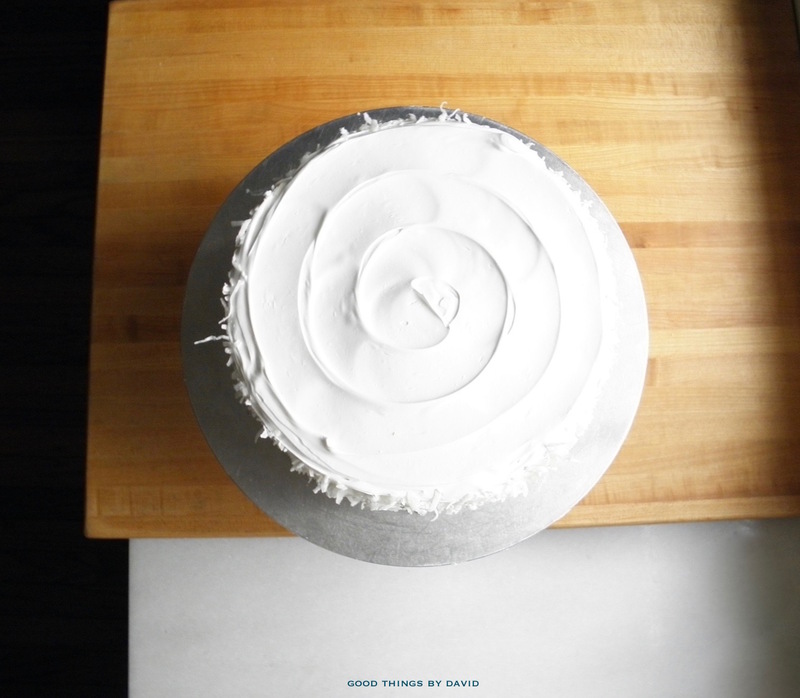 Gently add sweetened, flaked coconut to the sides of the cake, packing it on so that it sticks to the Swiss meringue frosting. For this cake I was instructed to write out a Happy Birthday message which presented a slight problem. 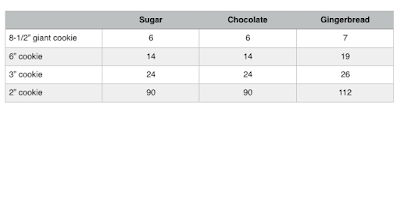 How to do it on a cake with flaked coconut? Well, the answer was to leave the top of the cake bare. Using a wide offset spatula (or the back of a large spoon), and working from the edge of the cake toward the center, turn the cake turntable while holding the spoon on top of the frosting. Begin to snail it toward the center until you have the desired effect. With a small amount of stiff royal icing tinted in any shade you want, add the birthday message along the top. Special shout to to Martha Stewart and her design team at Macy's for having come up with this gigantic cake spatula. At almost 10" in diameter, it makes the transferring of layer cakes onto cake boxes or cake stands a very easy task. 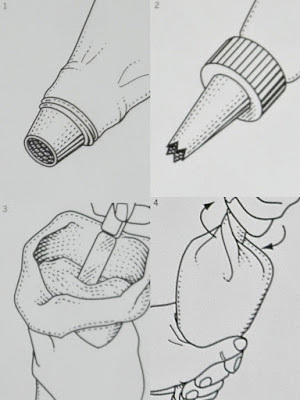 I can't thank Martha enough for this ingenious tool! Since this cake was flying out the door, I had to package it up in a nice bakery-style cake box. 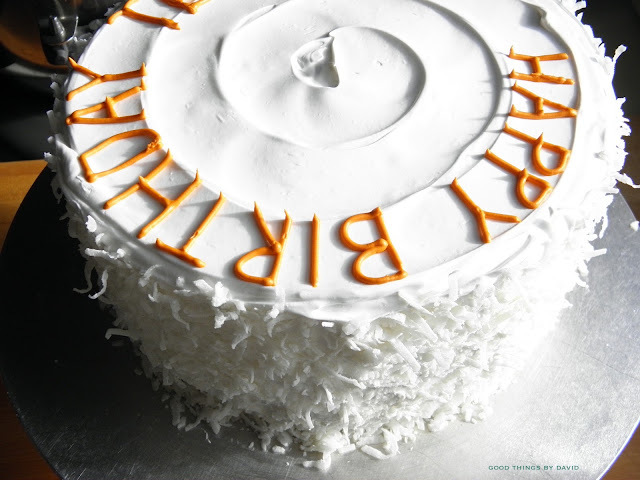 A Coconut Birthday Cake like this is bound to be devoured by everyone. Even if there are leftovers, make sure that you don't leave it around for too long. 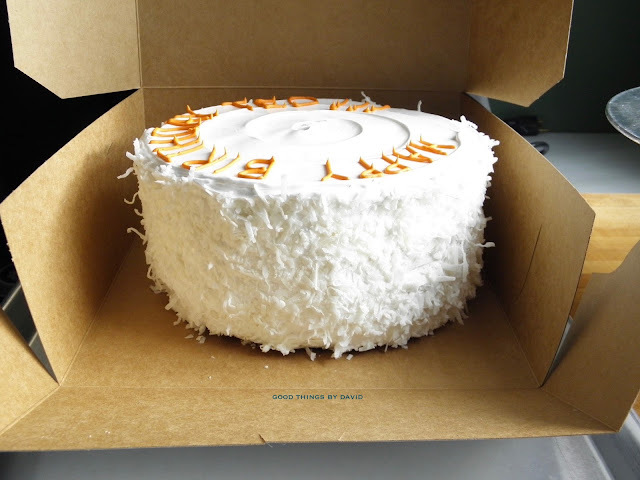 Bookmark this cake the next time you want to surprise someone with a coconut cake. 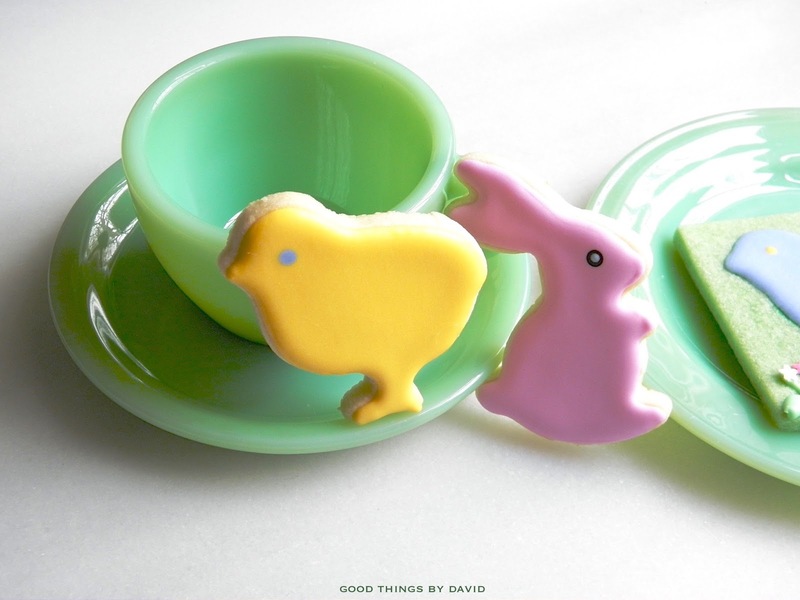 You can even make it this Easter and set the pretty cake on top of a jadeite or pink cake stand. Colored coconut can enhance it even more this spring, but so could a few decorated sugar cookies along the sides and on top of the cake. 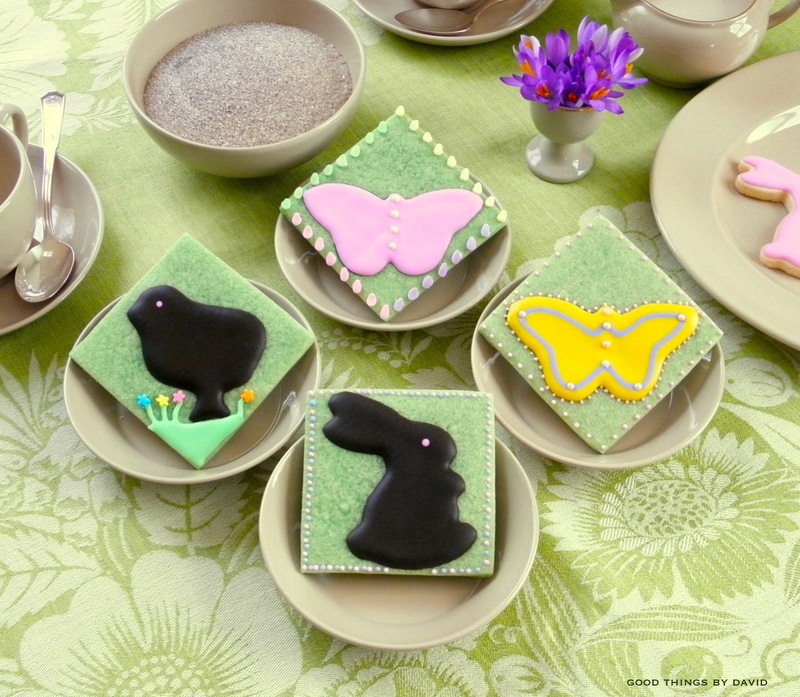 Decorated cookies for spring-themed celebrations can be elegant and charming without being too difficult to make. With a few shapes, and a handful of colors of royal icing and sprinkles, an entire set of cookies can be iced and ready for gift giving this spring. Think of these if you plan on having a baby shower, an Easter luncheon or if you want to surprise the kids with cookies in their Easter baskets. The cookies you'll see here were made for a dear friend in Dallas, Texas, who absolutely adored every single one. 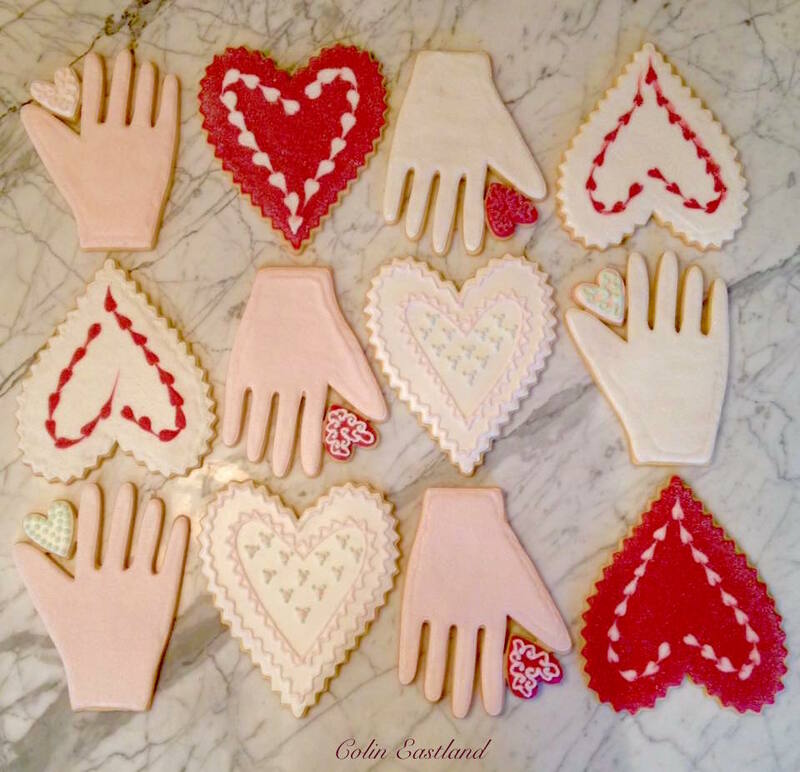 What I truly love about decorating sugar cookies is that I can express a theme or a color palette with only several cookie decorating embellishments. As you can see, those round cookies (above) are nothing more than plainly iced cookies that have silhouettes in whimsical shapes which evoke the spring season. In fact, those particular silhouettes are classic Martha by Mail. 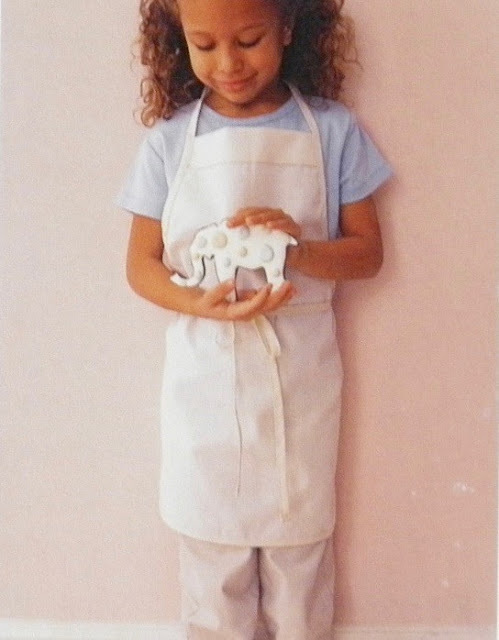 You may recall that several years ago I was gifted some sets of cookie cutters by a generous individual. When I saw the Easter Marshmallow Treat Cutter Set (on the right), I knew that they were going to be used a lot for making cookies. 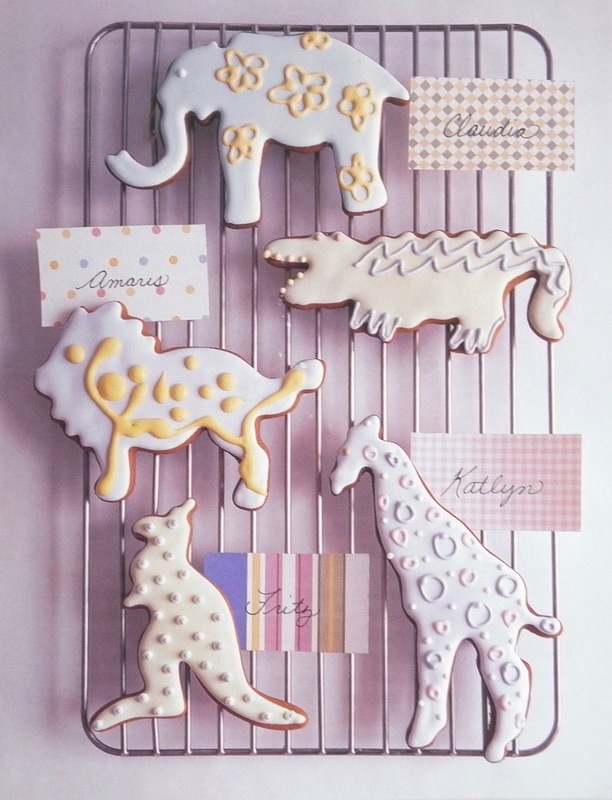 True to my word, I have made numerous cookies with them for my niece and nephews, as well as for friends. I can't thank Aurelia enough for her generosity! 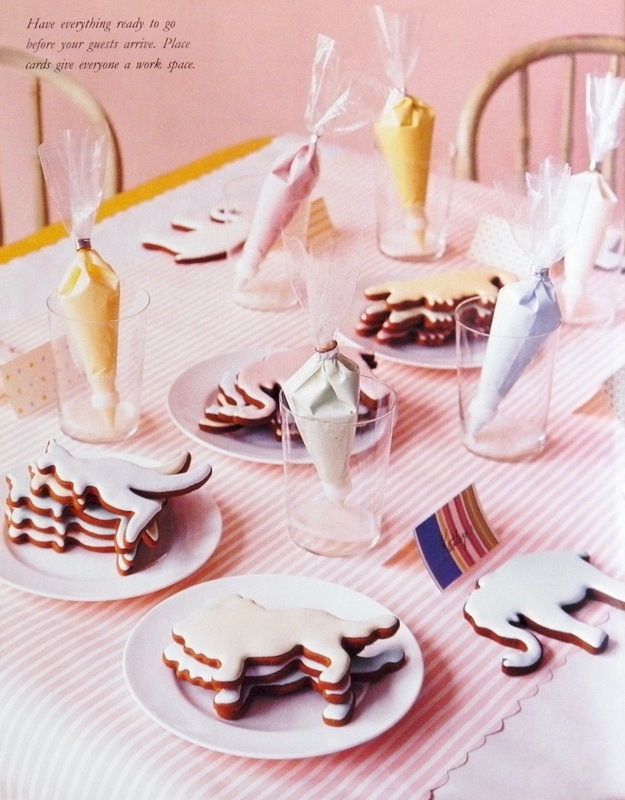 This table set for tea is enticing with its pastel-colored sugar cookies. 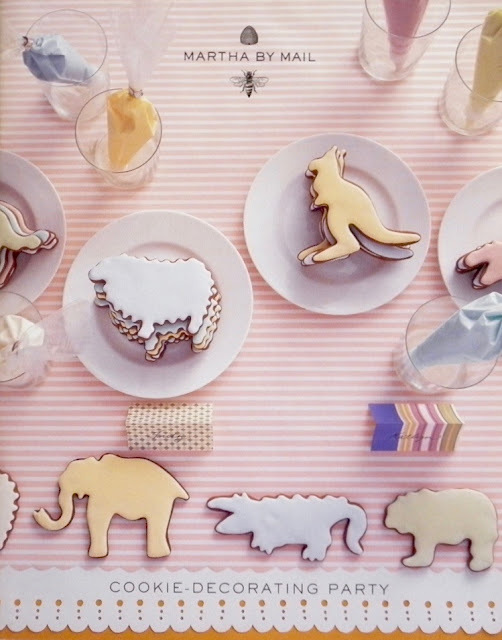 Some of the cookies set on that Wedgwood platter are cut out in their original shapes, while others are bas-relief silhouettes set against square sugar cookies tinted light green. I think I've said it here before, but as a cookie decorator, it's always nice to keep a few cookies to myself to enjoy in the afternoons if I have a free moment. You don't need me to tell you how nice they are if served on Fire King restaurant ware jadeite. Actually, they're good on any type of jadeite. 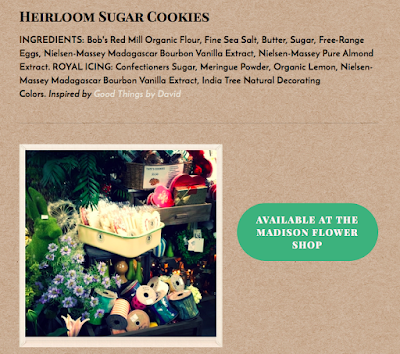 Whether you're making those cookies with a sugar cookie base or a delicious chocolate cookie recipe, use something that is tasty. 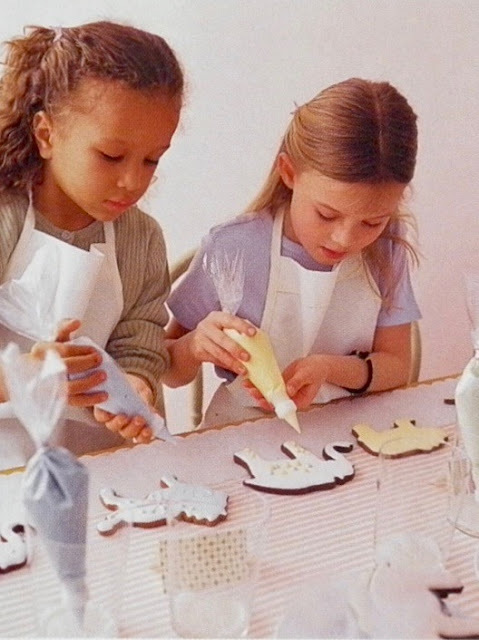 Your decorated cookies will only be as good as they look if you use quality ingredients that are fresh and full of flavor. 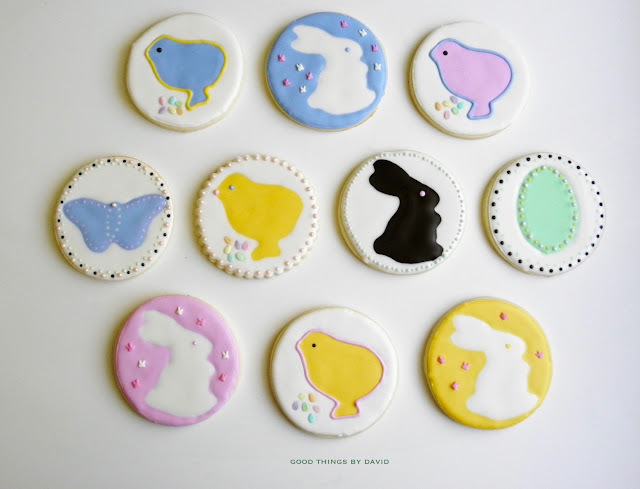 To make these beauties, either on a plain round, scalloped round or square cookie, trace the outline of the shape (bunny, chick, butterfly or egg) with the cookie cutter, using a food-safe marker. I like using either Wilton or Ateco pens. 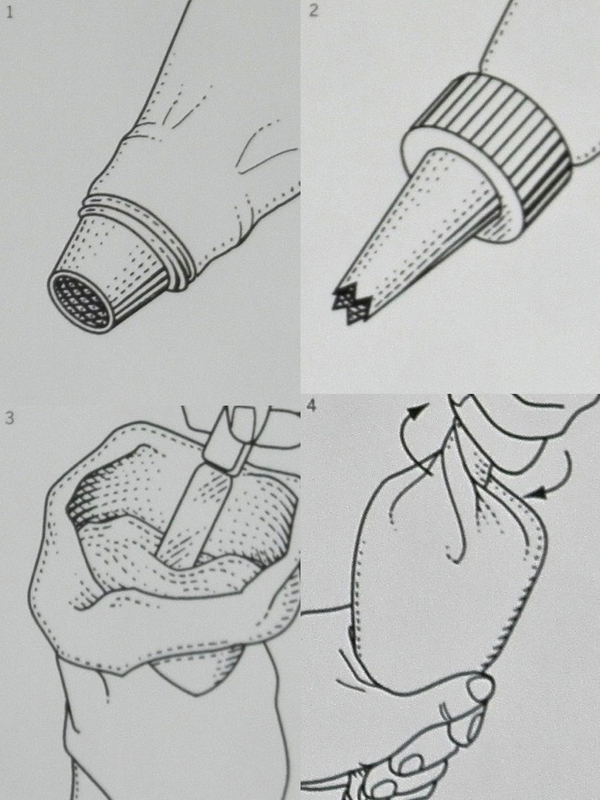 Make sure the shape is centered when tracing. Using tinted royal icing, outline and flood the traced shape. While wet, add eyes or dots as you see fit. Immediately outline the entire cookie (the negative) with white or colored royal icing, and flood it. If you're adding sprinkles, such as those pastel eggs, carefully do so while the icing is wet. Let the cookie dry. 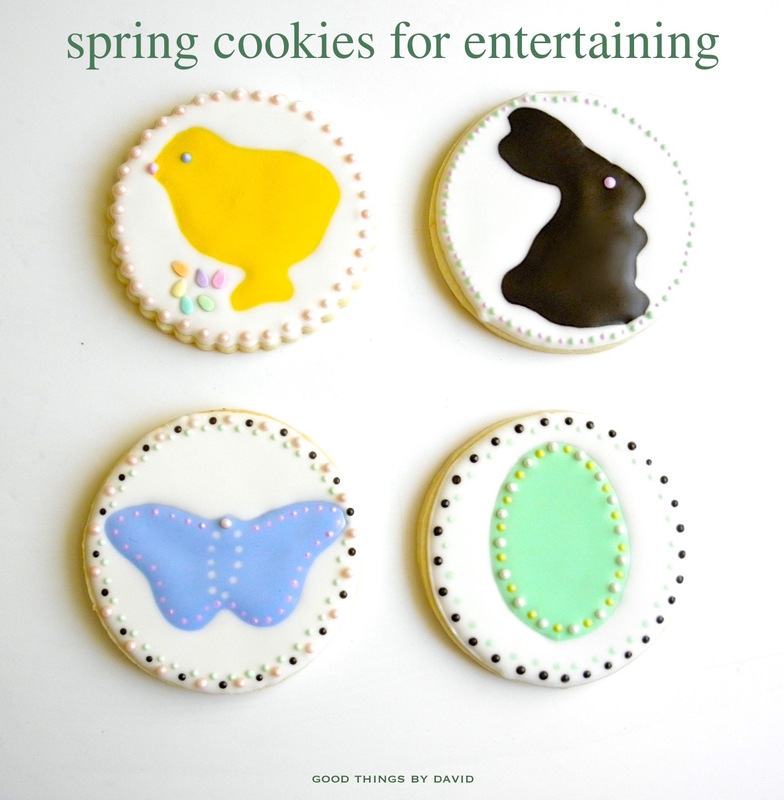 You can leave the cookie as is or you can enhance it even further by piping colored dots. Alternating colored dots (egg & butterfly above) is adorable, but even shimmery pearl candies are a good way to frame the cookie. Here is an overview of some of the cookies. As you can see, pastel blues, pinks and yellows are nice for a baby shower, Easter celebration or even a kid's birthday party. Tucking one into a clear cellophane bag and adding it to an Easter basket is a sure way to make the recipient feel extra special. 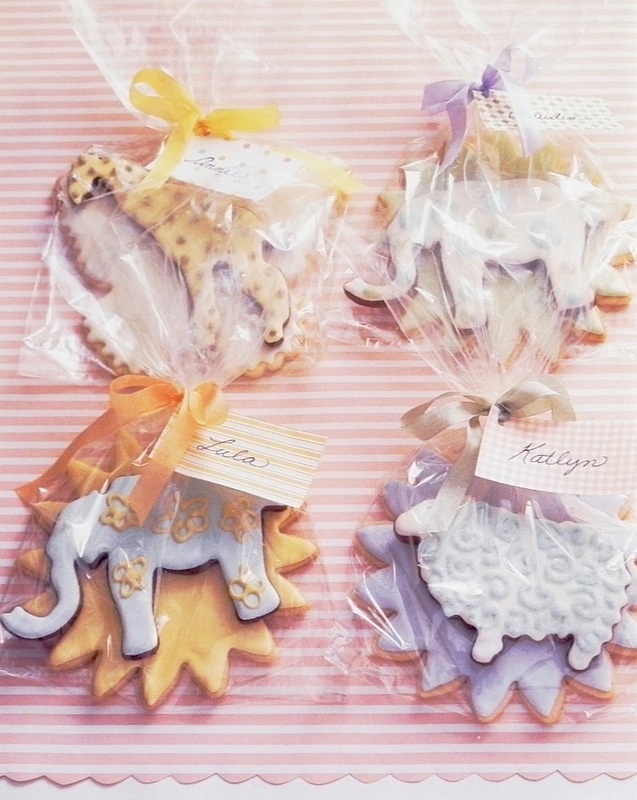 In fact, why not make an Easter basket with nothing but iced cookies? Marshmallow peeps have nothing on these cookies. Baby chicks and small Easter bunnies are festive if left plain. 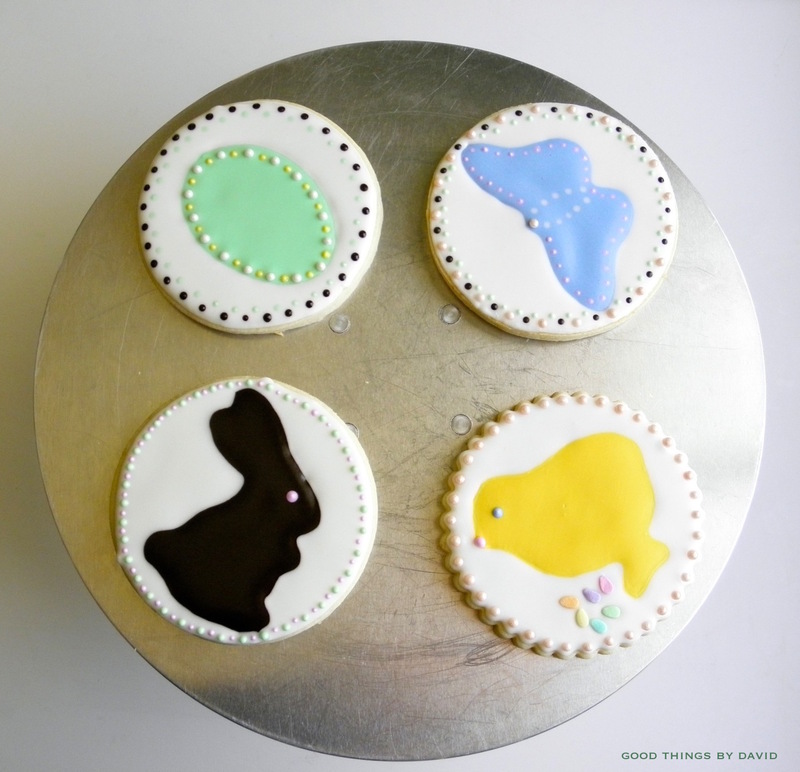 A simple royal icing treatment and a dot for an eye will suffice. 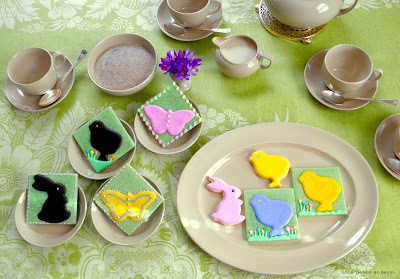 If you tint your sugar cookie base in a light green or even a pink, it can serve as the canvas for your icing design. These cookies take the same concept of the rounds, but lack the flooded negative. 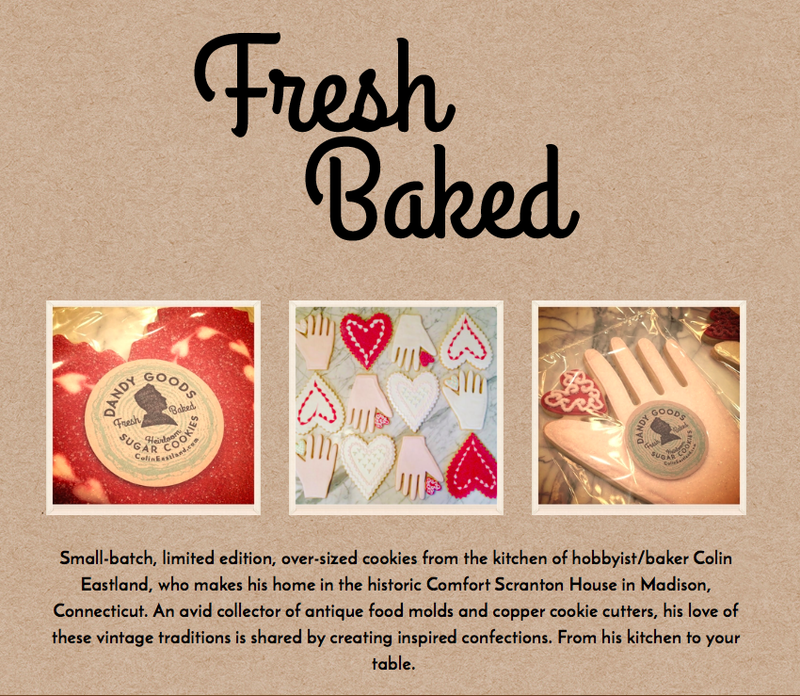 Made this way, the shapes seem to float from the cookie. In art this is known as bas-relief or 'low relief'. Just look at the chocolate-colored chick standing on the green grass surrounded by spring flowers. Adorable! Spring cookies for entertaining can be made over the course of a few hours and can be enjoyed whenever you have a gathering. As I said, one or two of these placed in a clear cellophane bag, tied with a colorful ribbon, make gift giving an easy thing. 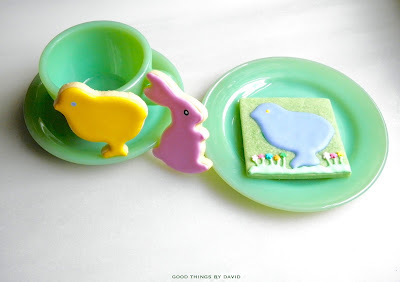 You can also set one at each place setting for your Easter luncheon (a perfect party favor) or you can place a few dozen of them on platters for dessert. However you want to serve or gift them, make sure there are plenty because everyone is going to want one. Lemon cakes are by far my favorite cakes to bake and eat. If you love lemons just as much as I do, then you don't need me to tell you about that sweet/tart element that is so enticing in lemon desserts. It is what it is! 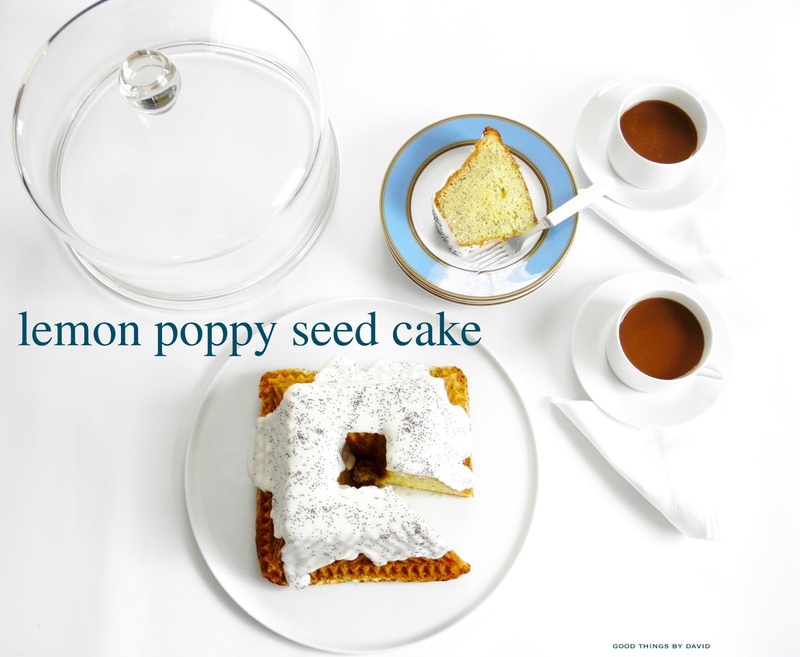 The combination of lemons and poppy seeds is classic. Layer cakes covered in rich buttercream are great and festive, but when you want something simple that is sure to be a crowd pleaser, then only a bundt cake will do. Bundt cakes are great to have on hand when company comes around, because they don't feel overly indulgent to enjoy with a cup of coffee for brunch or with some tea in the afternoon after a light luncheon. The cake portions can be as generous or as slender as one desires. 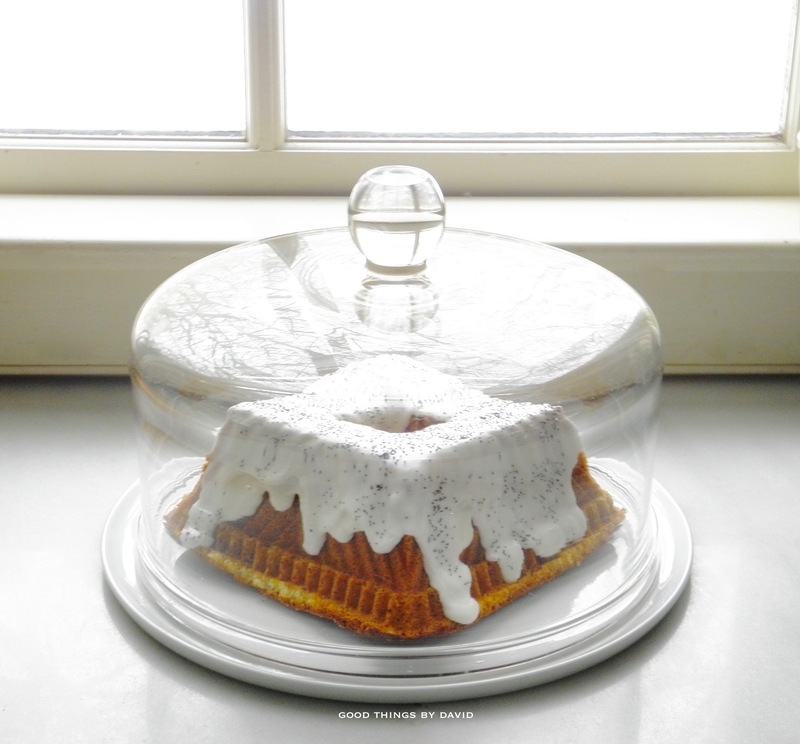 Whether or not you choose to ice a bundt cake, sprinkle it with confectioners sugar or leave it plain, it's bound to be a welcomed ending to any meal. 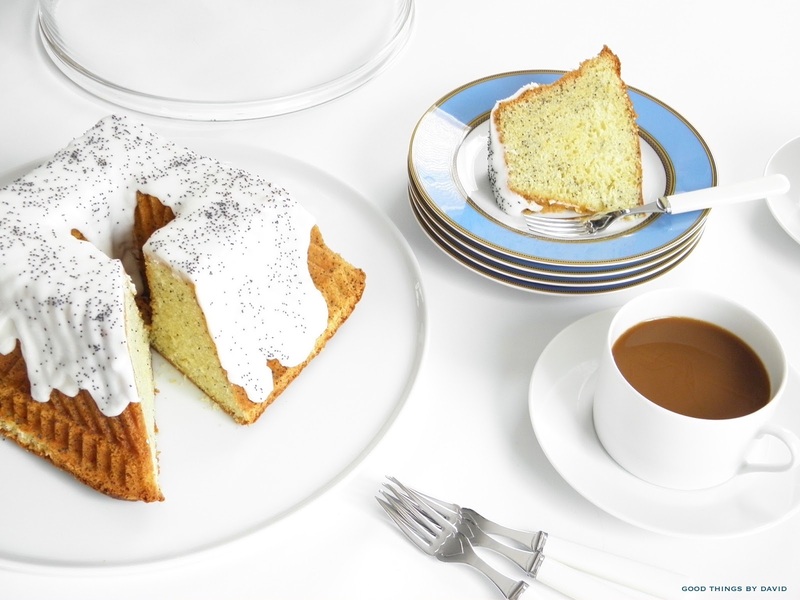 This special Lemon Poppy Seed Cake is baked with the basics of butter, flour, sugar, fresh eggs and lots of fresh lemon zest. It's up to you as to what type of lemons you use, but if you happen to have meyers, then by all means use them. Your poppy seeds, however, must be absolutely fresh and not at all stale. If you're unsure about the ones in your pantry, go to the supermarket and pick up a new batch. 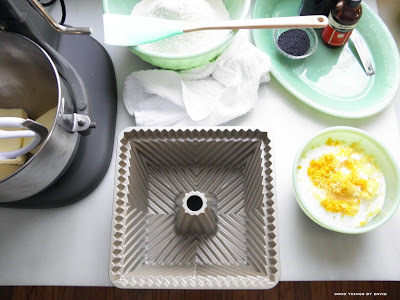 With the many shapes and sizes of bundt pans from which to choose at baking supply stores, it's fun using the more unusual ones for special occasions. 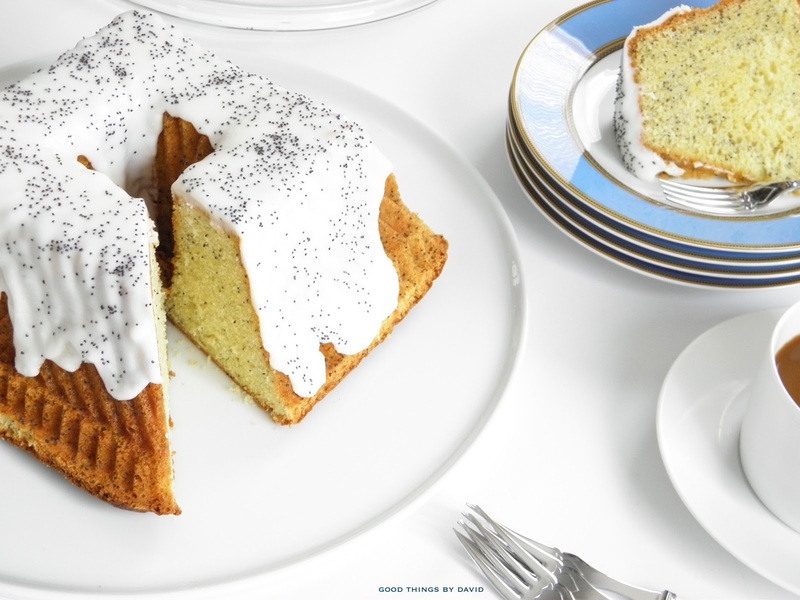 I recently added a square bundt pan from Nordic Ware to my baking pans, and thought: why not use it for that tasty lemon poppy seed cake I've been making for the past several weeks? 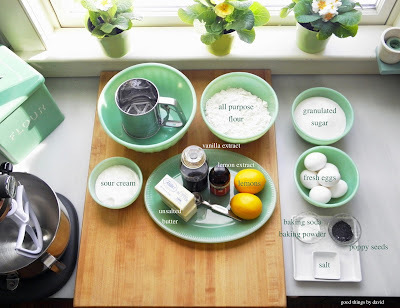 Let's bake a cake that every lemon connoisseur is going to enjoy. With a handful of ingredients and a few minutes of preparation, you can have a cake worthy of your best cake stand and cake dome. This is what I did for my family. 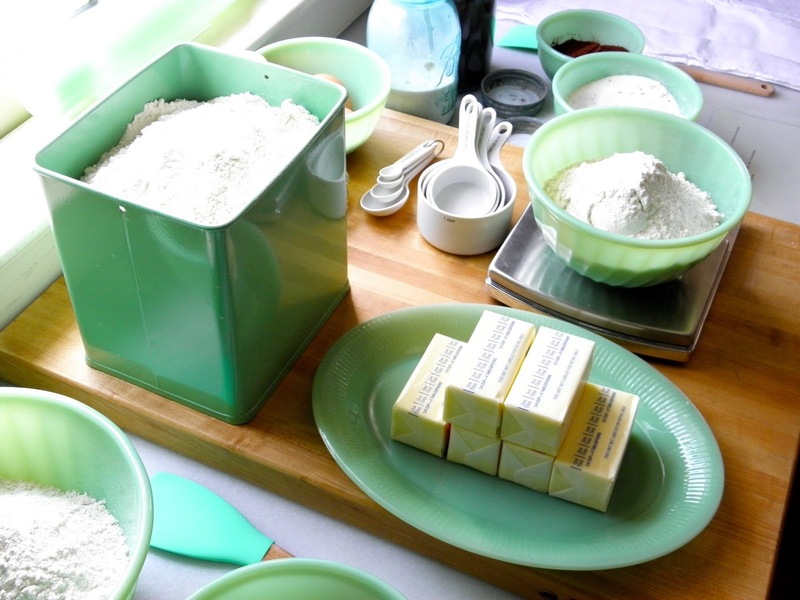 Equipment: 10-12 cup bundt pan, buttered and floured or sprayed with nonstick baking spray. NOTE: A smaller bundt pan, such as the square Nordic Ware pan, should only be filled ⅔ full of batter (you will have leftover batter if using this cake pan; if using the larger ones, like the 'Anniversary Pan', you can use the entire batch of batter). Leftover batter can be baked into cupcakes. Bake cupcakes 18-20 minutes. 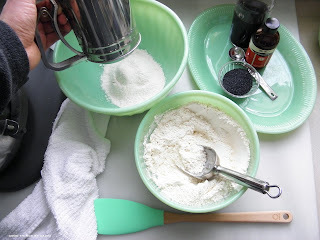 In a bowl, sift the flour, baking soda and baking powder. Keep it ready. In the bowl of your stand mixer fitted with the paddle attachment, cream the butter on medium speed until lightened, about 30 seconds. Add the salt, sugar & lemon zest, and cream on medium speed until light and creamy 4-5 minutes. Stop and scrape down the bowl and paddle at least once during this process. Add the eggs one at a time and beat until fully incorporated and emulsified. Stop the mixer and scrape down the bowl and paddle attachment. On low speed, alternate adding the dry ingredients with the sour cream; add 1/3 of the dry ingredients, then 1/2 of the sour cream, and so on. Begin and end with the dry ingredients. Add the poppy seeds and blend well. Pour the batter into the prepared Bundt pan and bake the cake for 50 minutes to one hour. The cake should feel springy to the touch and a toothpick inserted into the cake should come out clean when it’s completely baked. Let cool on a rack for 15 minutes; gently flip and remove the cake from the pan and cool completley. 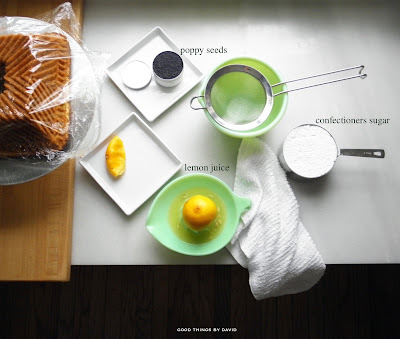 Mix confectioners sugar with 3 tablespoons of lemon juice and begin to thin it out by the 1/4 teaspoon with more lemon juice until you have a very thick, yet pourable icing. Sprinkle with poppy seeds while the icing is wet. Let set. If you can manage to resist slicing up the cake before company arrives, keep it in a cool environment so that the icing doesn't run into problems. For this occasion I remembered that I had a large 19th century blown glass cake dome, so I used it to cover the cake while it waited. Believe me, it was so hard to resist. When we finally did slice into it, I was pleased with how light the crumb was (sifting is very important as is not overmixing) and what a great flavor it had. Anything made with sour cream or even buttermilk comes out quite tender and delicious. There you have it. A very good lemon bundt cake with the added bonus of having tasty poppy seeds in both the batter and the icing, will have people asking for seconds. 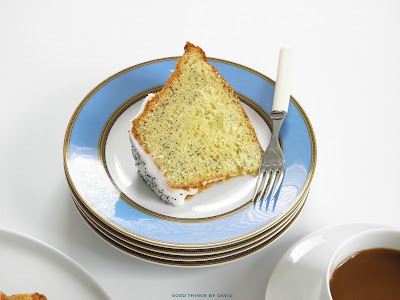 Whether you choose to enjoy a slice with a cup of coffee, some tea or even some milk, be sure to eat every last crumb. A cake like this will keep for a couple of days under a cake dome or tightly wrapped in plastic wrap, but why not share it with people so that you have no leftovers. Have fun baking this cake and do let me know what you think!